Editor's note: This historical sketch of Whitehern, one of the city's finest and best preserved old homes: was written by the Rev. Calvin McQuesten whose family has owned the dwelling for 101 years. "AN OASIS IN A DOWNTOWN DESERT." The photographs were taken by Dr. George O. MacMillan; former principal of the Normal School. 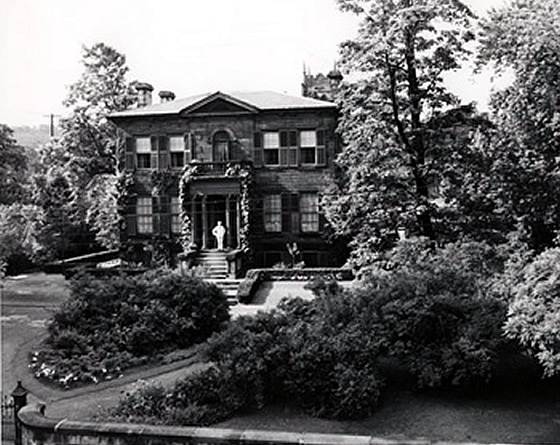 In 1852 the house and grounds on the south-west corner of Jackson and MacNab Streets were sold by Committees of Richard Oliver Duggan (who had been declared a lunatic) to Dr. Calvin McQuesten, M.D., for 800 pounds. Duggan had bought the land (approximately one acre) for 325 pounds in 1843. The house he built upon it (to which an upstairs kitchen and an apartment for maids were added in 1937 cost ten thousand dollars, when labour was 50 cents a day. He never lived in it. And it is likely that Dr. McQuesten occupied it as a tenant for some years before he obtained title to it. In 1835 Dr. McQuesten came to Hamilton to join his cousin John Fisher (who became Hamilton's third Mayor and later U.S.A Senator for the state of New York) in the manufacturing of a threshing-machine (the first in Ontario) which John Fisher himself had invented. (These young cousins were both farmer's sons). Their foundry stood on the north-west corner of James and Merrick Streets, where the Branch Bank of Toronto and Eaton's parking lot are now located. And in it were also cast the first cooking ranges made in Hamilton--highly ornate, tall, stately, wood-burning affairs; and also the iron work of the cars for the first train (recently commemorated in a four-cent stamp). When this enterprising New England physician and surgeon had accumulated a snug fortune of half-a-million dollars, he retired to read Jonathan Edwards and other Puritan writers (he was a ruling elder in the Presbyterian Church), and to enjoy his garden, which among other things contained an asparagus bed, half-a-dozen or more varieties of grapes, and a dozen or so kinds of pears, which latter he considered to be of very special medicinal value. His foundry, of which he was then the sole owner (John Fisher having moved to Batavia, N.Y., some years before) he handed over to his nephew, Luther D. Sawyer, who later took the Masseys into business. The home in which Dr. Calvin McQuesten spent the latter half of his life was first called 'Willow Bank.' But by 1885, when he died and his son Isaac moved in with his wife and young family of four girls and two boys, all that remained of the willows was a huge, rotting stump on top of each corner of the double terraces in front of the house, and a third of the south-west corner behind. So the young chatelaine of the house (mother of the two daughters still residing there, the Rev. Calvin and the late Honorable Thomas Baker McQuesten) renamed it Whitehern (i.e., 'White House') after a famous historic residence in England. When the house was built there was nothing between it and the hill but open fields. And when this young couple and their brood moved in, there was still pasture for the family cow within half-a-mile, and one or other of the children would frequently drive it back in the afternoon for the stableman to milk. In the block cornering it to the north-west were some of the meanest slums in the city, known as 'Bread Ticket Row,' because the original owner, when the tenants could not pay all their rent in cash, would pick up any bread tickets in sight. Just one block diagonally to the north-east is the corner of Main and James Streets, from which the head offices of the banks and the biggest office buildings in the city stretch north to the principal shopping centre only a block away, where King Street meets James at the Gore. Yet in the back garden of Whitehern, a tall Russian Mulberry hedge and the stable and high stone walls shut out the slums and the store, and only the tall graceful spire of St. Paul's Church and the beautifully designed summit of the Pigott Building break the illusion of an old English garden deep in the countryside, as the flowers and shrubs bloom in their seasons--snowdrops and scillas and crocuses, daffodils and hyacinths and tulips, shy Canadian wildflowers under the hedge, sweet English violets in the early spring and late autumn, graceful groups of irises, gorgeous masses of peonies of many named varieties, followed by tall larkspurs and lilies, phlox and pentstemons, and last but not least, the blue and yellow of goldenrod and Michaelmas daisies in the autumn. Over all these a succession of shrubs stand guard, some tall and stately, some low and bushy, but all with their profusion of variegated blossoms to add to the changing galaxy of colour. The viburnums with their shell-pink clusters of sweet-scented starlets take the first watch. Then come yellow forsythias and scarlet japonicas, weigelas and deutzias, solid masses of mock orange, lilac and honeysuckle, and graceful golden links of laburnum. Above these rise the fruit-blossoms--cherries, apricots, peaches and nectarines, apples and pears. And higher than these are the flowering trees, stately catalpas with their masses of white bloom, the Japanese Varnish tree (from the sap of which lacquer of brilliant hues is made) with its golden cones of tiny bells, and the Chinese Pagoda tree, whose pale clusters of pea-shaped flowers come too late in August to ripen for seed; while in front and on both flanks huge maples tower to shut out the sight of surrounding walls of dreary red brick. 1 Another newspaper article written by Rev. Calvin can be found at Box 09-233.